Abu ‘Abd ar-Rahmān al-Khalīl ibn Ahmad ibn ‘Amr ibn Tammam al-Farāhīdī al-Azdi al-Yahmadi (Arabic: أبو عبد الرحمن الخليل بن أحمد الفراهيدي‎; 718 – 786 CE), more commonly known as Al-Farahidi or simply Al-Khalīl, was one of the earliest Arab lexicographers and philologists. His best known contributions are Kitab al-‘Ayn (Arabic: كتاب العين‎) regarded as the first dictionary of the Arabic language, the current standard for Harakat (vowel marks in Arabic script), and the invention al-‘arud (the study of Arabic prosody), musicology and metre. His study also formed the basis for prosody in the Persian, Turkish and Urdu languages as well. Al-Farahidi was considered the “shining star” of the Basran school of Arabic grammarand a legitimate polymath who was not only a scholar but a genuine man of original ideas. Born in 718 to Azdi parents of modest means, al-Farahidi was from southern Arabia (modern day Oman) and later moved to Basra, Iraq. Originally a Kharijite from the Ibadi sect of Islam, he converted to Sunni upon his move to Iraq, where he lived a simple and pious life; he was only a second-generation Muslim, his parents having converted to the faith. It was said that al-Farahidi’s father was the first person to be named “Ahmad” after the time of the Muslim prophet Muhammad. His nickname “Farahidi” differed from his tribal name as one of his ancestors was named Furhud; a furhud is a young lion and the plural is farahid. The modern-day descendants of his tribe are the Zahran tribe residing primarily in the Al Bahah Province of Saudi Arabia.While in Basra, he was a student of Abu ‘Amr ibn al-‘Ala’. Unlike his contemporaries among Arab and Persian men of letters, al-Farahidi refused both lavish gifts from the ruling class and sinking to the level of maliciously slandering and rumor-mongering against his intellectual rivals. While in Basra, he made a living as a language teacher. He was said to have lived a pious and simple life, performing the pilgrimage to Mecca almost every year. Al-Farahidi lived in a small house made of reeds and once remarked that once he shut his door, his mind did not go beyond it. Although some of his students amassed wealth through their own teaching, most of al-Farahidi’s income was from falconry and a garden he inheirited from his father. Al-Farahidi’s date of death has been listed as both 786 and 791 CE. His preoccupation with deep thoughts led to his death. It is said that one day, al-Farahidi was attempting to work out an accounting system in his head which would save his maid servant from being cheated out of money by a green grocer; he then absent-mindedly bumped into a pillar of a mosque he had wandered in to and sustained a fatal fall. 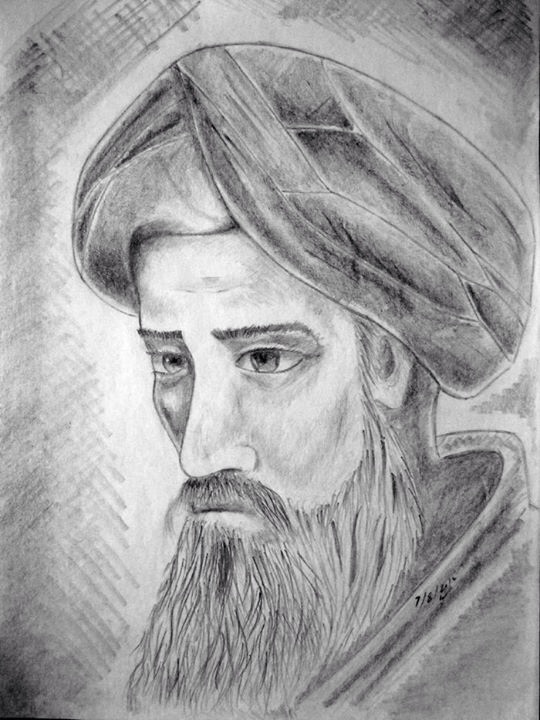 Al-Farahidi was already a household name in the Arab world before his death; he was as respected as the possibly mythical figure Abu al-Aswad al-Du’ali in Arabic philology, was the first person to codify the complex metres of Arabic poetry, and has been referred to as the outstanding genius of the Muslim world. Sibawayh and Al-Asma’i were among his students, with the former having been more indebted to al-Farahidi than to any of his other teachers;Sibawayhi quotes al-Farahidi 608 times in his infamous Kitab, more than any other authority. At any point in the Kitab when Sibawayh says “I asked him” or “he said” without mentioning a name, he is referring to al-Farahidi.Both the latter and the former are historically the earliest and most significant figures in respect to the formal recording of the Arabic language. In addition to the Arabic language, al-Farahidi was also well versed in astronomy, mathematics, Islamic law, music theory and Muslim prophetic tradition. His prowess in the Arabic language was said to be drawn, first and foremost, from his vast knowledge of Muslim prophetic tradition as well as exegesis of the Qur’an.The Al Khalil Bin Ahmed Al Farahidi School of Basic Education in Rustaq, Oman is named after him. Did you know about Arabic history?